Ultimate decided to take the dry topic of engagement, but transform it into something really exciting with our creative and unconventional approach. Employee engagement is known to result in better productivity, staff retention and job satisfaction amongst staff. We wanted to be completely bee-hind our team members, making sure that they each feel valued by giving them rewards that recognise their hard work and dedication to developing the business. However, employees often don’t engage particularly well with dull or uninspiring spreadsheet formats. Ultimate wanted to do something different, by showing off what we do best, thinking up truly creative ideas and concepts with amazing results. The response to the Ultimate Hive has truly been unBEElievable. Our bee puns really sting sorry we’re just WINGING it! Our small business is a hive of activity and our buzzy worker bees are always working hard to produce amazing campaigns across our six departments (Sales, Digital Marketing, Web Development, Design, Account Management and Presentations). Ultimate really identified with the humble bumble bee, as although a small creature bees work together industriously and diligently to produce something amazing, a hive full of honey ready for the winter. Just like the bumble bee, Ultimate strive not to be the biggest, but to be the best. It was important to ensure that the incentives for the team were highly visible, allowing team members to see the progress they are making towards their goals, maintaining the momentum and helping us to celebrate successes. 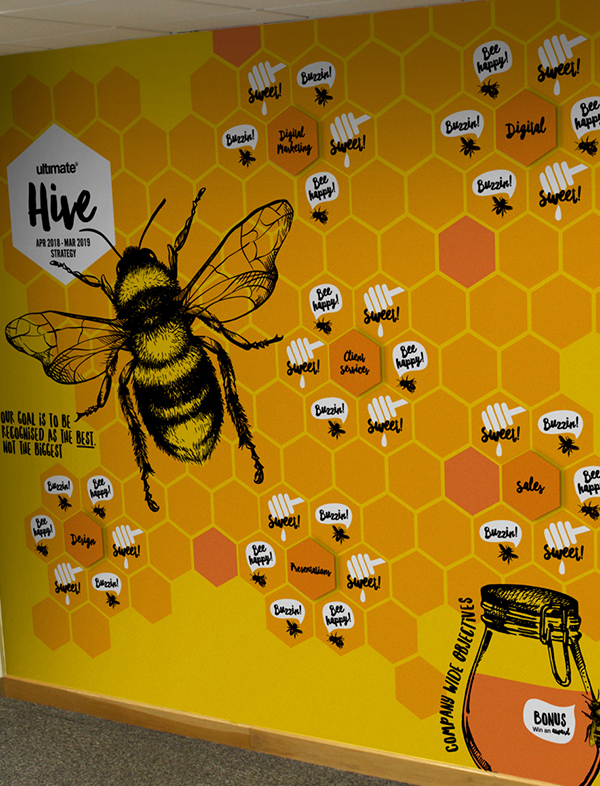 Our talented design team took this concept and brought it to life, by designing the Hive graphic which would become a feature wall in the office. 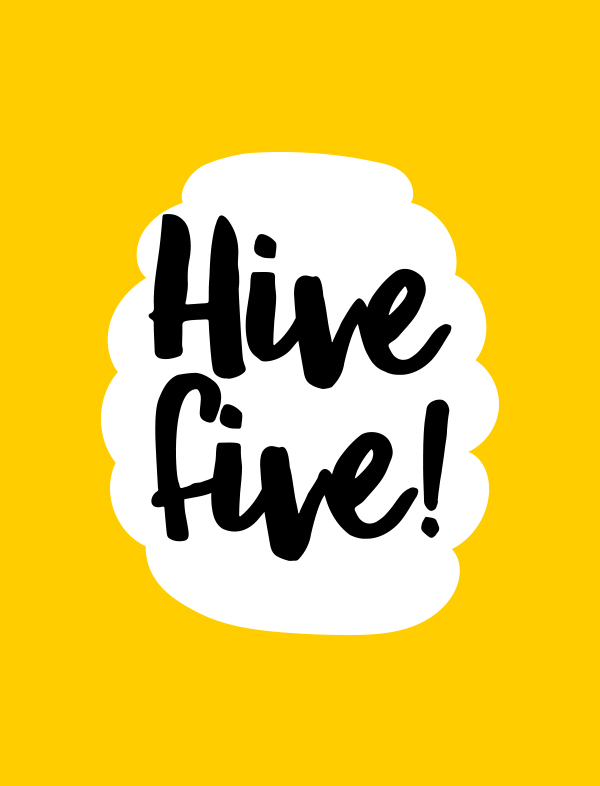 Our design team also created additional assets including stickers, which each feature encouraging and punny phrases such as ‘Bee Happy!’, ‘Hive Five!’, ‘Buzzin’, and ‘Sweet’. The stickers meant that teams could mark once a goal is achieved and the more stickers that are collected, the more the Hive appears to fill up with honey. This visual representation of progress meant that we can build up excitement about the Hive and motivate the teams to continue smashing their objectives. These goals were chosen with the business in mind, as we selected those that would have the most positive impact and the rewards were carefully considered to best motivate our very buzzy team members. We hope you have loved learning about Ultimate’s hive and how we like to engage our fantastic team. Now it’s time for us to buzz off and get buzzy, but we leave you with swarm wishes!